Qatar Airways has always been known to be a forward thinking brand. To celebrate Qatar Airways’ 100th Destination, the brand wanted to celebrate by reaching out and engaging their audiences on a different platform. Back then, the brand was still very new to their foray to social media and establishing a successful business case study was critical. The brand first embarked on a social media listening campaign to find out what their audiences were most concerned about. By mapping out the conversations on the social web, we determined that the chief sentiments of Qatar Airways were prices and the extreme hospitality. 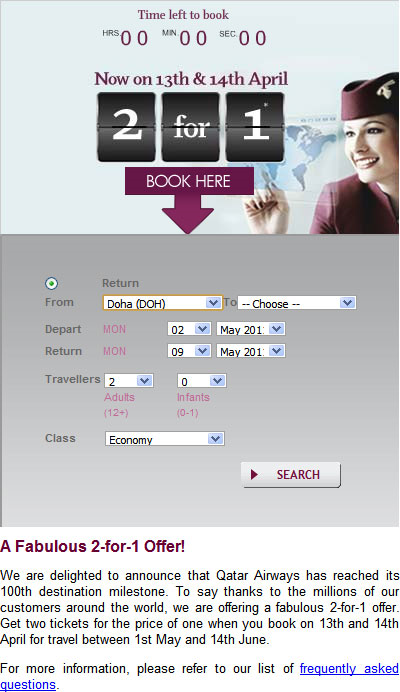 As such, Brew Interactive and Qatar Airways put together a 2-for-1 offer to anywhere Qatar Airways could fly. We believe that would compel consumers to experience Qatar Airways and pay for value. 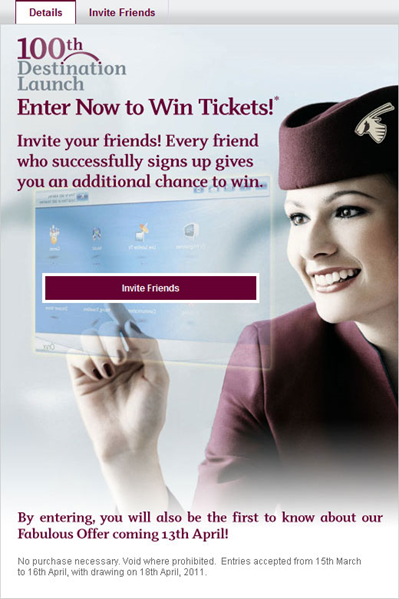 Additionally, Brew Interactive worked with Qatar Airways to produce a Sweepstakes application coded in 4 languages to gather sign ups for the 2-for-1 offer. The sweepstakes prize was 100 complimentary tickets to commemorate the launch of their 100th destination. The digital activation reached out to 75 countries where Qatar Airways operates. The brand decreased their email lead acquisition cost by 20%. A social-only promotion drove incremental revenue by generating over $1.1 million of ticket sales in less than 48 hours.